Ricoh® - a leading global manufacturer of multifunction devices. Ricoh® is a leading global manufacturer of multifunction devices. By utilizing Ricoh's RiDP technology, Umango has delivered support for the Ricoh® Smart Operator Panel (SOP) devices. 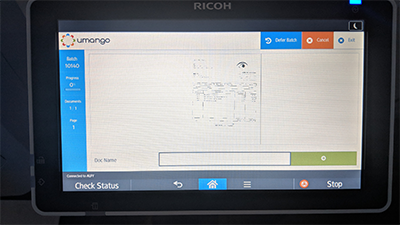 The efficiencies Umango provide to Ricoh® SOP devices is the ability to push scanning workflows directly to the devices without the need for any additional software installed on the device. Having the workflows deployed to the MFP enables you to review extracted information from your scanned paperwork directly on the touch screen (we call this profile on device POD). For more details on Umango's MFD technology working with Ricoh devices contact a Umango reseller or read the details on on this website.